Vomit often has a faint or light brown color. 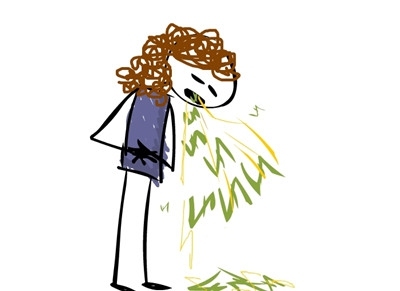 If your vomit looks greenish yellow, you may be throwing up bile. Bile (or bile juice) is a fluid produced in the liver and passed to the small intestine. It contains bile acid that helps you digest and absorb fats from food. Normally, bile does not enter the stomach or come out when you vomit because a sphincter (a strong ring-shaped muscle that guards the end of stomach) prevents food from the intestine from coming back up. However, when this sphincter, called the pyloric valve, opens, food mixed with bile from the small intestine can flow backwards to the stomach. This may be the reason for throwing up yellow substance. Throwing up bile has many possible causes, which should be treated accordingly. There are a number of reason why a person vomits bile. It may be the consequence of an empty stomach due to excessive vomiting in response to stomach virus or other irritation. Throwing up bile is the result of the body’s defense-mechanism due to multiple vomiting episodes. It may also caused by too much bile in the stomach or other conditions. You may throw up bile if you have an intestinal obstruction that blocks the flow of food in the intestines. Since bile is mixed with food, an intestinal blockage caused by inflammatory bowel disease, gallstones or adhesions can force out these contents into the stomach and cause you to throw up yellow vomit. This is also accompanied by severe abdominal pain and constipation. Bile reflux is a condition similar to acid reflux. However, your stomach is throwing up bile instead of acids. When you have too much bile in your stomach, your body tries to get rid of it, which causes throwing up bile. This disorder may be caused by peptic ulcers and stomach surgery such as gallstone removal, which causes building up of excess bile in the healing phase. This is a rare disorder that may cause you to throw up bile. Cyclic vomiting syndrome is characterized by random, violent vomiting that happens for no reason in otherwise healthy people. Vomiting bouts can occur from 1 to 10 days, and this can happen more than once every month. Repeated vomiting irritates your stomach and causes increased production of bile, which causes throwing up yellow vomit. Excessive alcohol consumption for long periods of time can irritate your stomach lining and cause throwing up bile. Certain prescription drugs, such as digitalis and morphine may also trigger the brain’s chemoreceptor zone to fire, which increases your urge to vomit. Gastroenteritis or stomach flu is usually caused by a viral infection from the consumption of contaminated water or food. Abdominal cramps, vomiting, diarrhea, and dehydration are common symptoms. If you find blood in your stools, you may be having a bacterial infection. Gastroenteritis makes your body unable to digest food for about 2 to 3 days, and may cause throwing up bile after meals. Certain foods may trigger allergic reactions due to unexpected immune responses, forcing you to vomit ingested food and bile. This may be accompanied by runny nose, stomach cramps, and breathing problems. Eating food that is cooked in unhygienic conditions may cause food poisoning from harmful bacteria or viruses. Symptoms include fever, abdominal pain, diarrhea, and vomiting food and yellowish bile. If bile reflux or other digestive problems are the reasons, your doctor may prescribe bile acid sequestrants, which can disrupt bile circulation and reduce the amount of bile in your system. Other medications include proton pump inhibitors, ursodeoxycholic acid, or pro-kinetic agents, which relieve frequent digestive problems and help protect your esophagus from corrosion. Antibiotics may be taken for bacterial gastroenteritis as well as antiemetics like promethazine to stop vomiting. Drink plenty of fluids (at least eight cups of water) throughout the day. If you have stomach flu or food poisoning, keep your body well hydrated to prevent excessive loss of bile. It is also advisable to take electrolyte solutions slowly to maintain balance until your symptoms improve. Vomiting is your body’s signal for you to restrict your diet temporarily. Take bland foods or broths to reduce digestive stress until nausea and vomiting pass. Eat smaller meals, drink sweet beverages such as fruit juice to replace lost sugar, and eat salty snacks to replace lost salt. However, avoid them if they make you feel sick. To reduce throwing up bile, avoid eating foods that increase acid production and relaxation of the esophageal sphincter. These include caffeinated drinks, carbonated beverages, citrus foods, chocolate, vinegar-based dressings, tomato-based foods, onions, mint, and other spicy foods. Avoid foods that trigger food allergy or cause food poisoning. Avoid alcohol, which relaxes the esophageal sphincter and irritates your esophagus. Ask your doctor about replacing certain drugs that cause you to throw up. Some herbal supplements such as ginger and cinnamon can help relieve nausea and vomiting. These may be available as tablets or tea. Yellow dock is another herb that helps control bile production and improves other digestion disorders. Ask your doctor about taking health supplements for problems with throwing up bile. Intestinal blockage: a surgery needs be done to unblock the bowel. This is the most common treatment for this condition to stop the vomiting. Bile reflux: a fundoplication surgery may be done when severe symptoms occur. This can increase the esophageal pressure and stop vomiting bile. Food allergy: the patient may be put under epinephrine injections to relieve the symptoms.